The General menu includes things like your site’s title, tagline, e-mail address, timezone and the date and time formats. 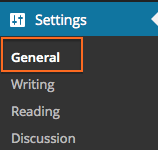 In the Admin Panel, click on Settings > General. Site Title – This is the site title you chose when you created your site. You can edit it here anytime. Tagline – This is a short explanation of what your site is about. It shows up in most themes under the Site Title. Leave it blank if you do not want one displayed. E-mail Address – This is the e-mail address where you want your site’s messages sent. This address will be used if you want notification of pending moderated comments. Date Format – Choose your preferred method of displaying the date. Note: if you want your posts to display the time as well as the date, you can choose Custom and format the time accordingly. See the WordPress Codex for “Documentation on date and time formatting“. Time Format – Choose your preferred method of displaying the time. Week Starts On – This allows you to change the day the week begins.